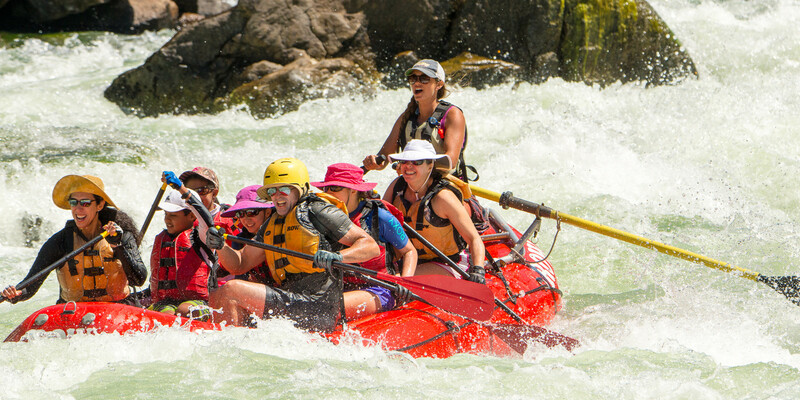 TRIP INCLUDES: Services of our talented adventure consultants and professional guides, all meals/beverages as indicated in the itinerary (including beer and wine), all rafting/camping gear, transportation to/from river meeting points. The cooler months in June and September have been our guests favorite for hiking the Salmon. Our trips are designed to begin in Stanley and end in Salmon. While this may seem a little inconvenient, we do it for a reason. If a trip includes transportation back to Stanley at the end of the trip, you must be off the river no later than noon (and many companies are off by 10 am!) as it is a two-hour drive to Salmon, plus another three hours to Stanley. ROW doesn't believe that you should pay for a day on the river, but end up on a bus for most of it. Thus, we enjoy lunch on the river our last day, arriving at the take-out about 2-3pm and to the town of Salmon by around 5 pm. ROW will make your pre- and post-trip hotel reservations for you and this will be reflected on your invoice. The evening before the trip we stay in Stanley, Idaho at the Mountain Village Resort. At 7 pm MST ROW’s Team Leader will meet you for a one-hour orientation, to answer last minute questions and give you your waterproof bags to pack. This is an important meeting, so please be on time. The next morning, we meet at the designated time set by your Team Leader and transport you by bus about two hours to the put-in point at Boundary Creek. Please have breakfast on your own before we meet. At the end of the trip, we return you to the Stagecoach Inn in the town of Salmon by 5 pm where we encourage you to spend the night and enjoy our hosted, relaxed "farewell dinner" with other trip members and the ROW crew. The Stagecoach Inn will be happy to provide transportation to the airport the morning after your stay. Note: On a typical year, the first 23 miles of the Middle Fork become too low to float by late July or early August. In this case, we use a backcountry air taxi service to fly all our guests from Stanley to an alternative put-in point at a place called Indian Creek, where there is no road access. The additional expense for this flight (about $150 per person) will be billed to each trip member. The same situation sometimes occurs on early June trips due to too much water and/or the put-in road being closed due to snow. In any case, we still float for a scheduled number of days and none of your off-river travel plans will change. Leave your car at the motel in Stanley at the beginning of the trip. River Shuttles will drive your car from Stanley to Salmon. You can contact River Shuttles directly before your trip to prearrange a shuttle at 208-756-4188 or you can arrange the shuttle at our orientation meeting the night before your trip. The cost is about $115, not including gas, payable by check or cash directly to the shuttle company the evening before the trip. The Mountain Village Lodge charges an additional $15 per vehicle left for shuttling. The nearest major airport is Boise and you need to arrive in Boise the day before the launch dates listed, arriving no later than 4-5pm. From Boise you have two options: 1) Take an air taxi from Boise to Stanley and then from Salmon to Boise at the end of the trip. The cost is roughly $400 including tax. Please call Gem Air at 208-756-7382 or Sawtooth Flying Service directly at 800-798-6105, to make these reservations. 2) Rent a car and drive about 3 hours to Stanley. Then have it shuttled to Salmon for about $115, not including gas, payable by check or cash directly to the shuttle company the evening before the trip. The Mountain Village Lodge charges an additional $15 per vehicle left for shuttling. Then your car will be awaiting you at trip's end. It's about a 6-hour drive back to Boise from Salmon. You should not book your return flight out of Boise until after 8:30 am the day after your trip gets off the water. (Example- On the July 6th trip, you'd fly to Boise on July 5, be on the river July 6-11, spend the night of the 11th in Salmon, then the morning of the 12th take the air taxi flight to Boise, and fly out of Boise sometime after 8:30 am.) The air taxi service will take you from Salmon to Boise (1.5-hour flight) whenever you need to leave, based on your commercial flight from Boise and the schedules of any other passengers who might have flights within an hour or two of yours. Exact flight time from Salmon to Boise will not be confirmed until the evening before the flight. If you want to visit other places in the region, groups of four or more may find good economy in chartering an air taxi plane at the end of the trip to take them from Salmon to some other location, such as Missoula, Montana (on the way to Glacier National Park) or Jackson Hole (near Yellowstone) where you can pick up a rental car. In this case, you will need an air ticket that takes you from your home to Boise and allows you to return home from Missoula or Jackson Hole. Spokane, Washington is just 4 hours west of Missoula and is another common airline gateway, so a nice loop is to get a car in Missoula, drive to Glacier and end in Spokane. If you have luggage that you won’t need on the trip there are a couple of options. 1) You may place it on the ROW vehicle where it will be awaiting your arrival at the hotel in Salmon. 2) If you are driving to Stanley leave your luggage in your car, as it will be awaiting your arrival in Salmon. If you need to reach ROW at the last minute, try our office first at (208) 765-0841 or 800-451-6034. All of your personal items should be packed into a soft-sided duffle bag approximately 12” x 13” x 24” in size. Due to weight allowances and raft space, please limit your gear to 20-25 pounds. (This is especially important for late July and August trips where we’ll most likely be flying in small airplanes to the put-in at Indian Creek!) This bag will then go inside of your large waterproof bag provided by ROW. One pair of river sandals (must have an ankle strap, no flipflops!) Velcro is okay if in good condition. Popular name brands include Chaco, Teva, Keen, or Merrells. Tennis shoes with polypro socks are a good option if your feet tend to get cold. These shoes are for creek crossings and the last 20 miles through Impassable Canyon where raft ride is required. Well broken in high top boots. Fishing gear and Idaho fishing license if you plan to fish - must be in a protective case & disassembled. We suggest you buy lures at the Stanley Fly Shop (208-721-7151) as they have daily updates of what the fish are hitting. Only catch and release fishing with single barbless hooks is allowed!! ROW provides Farmer John style wetsuits for our cold weather trips through July 6 (long legs, but no sleeves). These are often worn with your polypro long underwear underneath for extra warmth. You will still need your fleece sweater and rain jacket for warmth on your upper body. Wool or fleece socks can also be worn with the booties if your feet tend to get cold. If you plan to fish, please bring your own fishing gear (with a protective case), as we do not have any to loan. An IDAHO fishing license is required if you plan on fishing. You can pre-purchase a license by going to the website https://idfg.idaho.gov/license/purchase-options. You can purchase a license in Stanley at the Stanley Fly Shop. Click on the link for current information or you can call the fly shop at 208-721-7151. You must have a current driver’s license to purchase a license. ROW packs moderate quantity of soft drinks as well as wine and beer for legal age guests. If you bring liquor, please give it to your guide in a labeled plastic container (Nalgene, Platypus soft bottle). Beer should be in cans - No glass beer bottles please. Bottled wine is fine. All liquors in IDAHO are sold in State Liquor Stores with limited hours. Please be aware we have limited space on our rafts therefore moderate quantities, please. If you are arriving after 7 pm BE SURE TO PURCHASE your liquor at home and bring it with you. Middle Fork Reading List - Some of our favorite books at the Middle Fork and Salmon River. Boise Guide - Helpful ideas on what to do before or after your trip. Middle Fork Salmon River Flow - See how the River is running. Weather Report - Check the local weather before you go. Trip Photo Album - Browse a photo album from a recent trip. Save our Wild Salmon - Get educated - Join the cause.